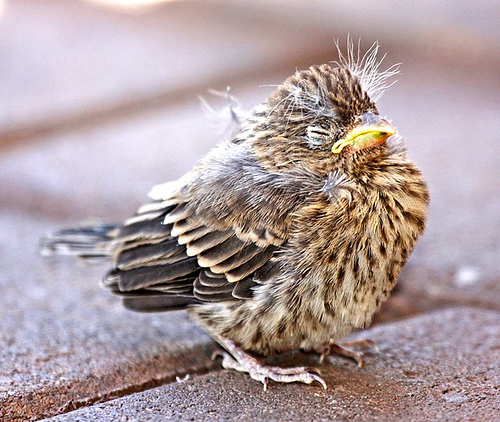 We got good news on the baby finch today! I don’t know if you remember, but my friends Dan and Mike Came to my house, took a baby finch (still in its egg but poking his head out) up to the Ohio Wildlife Center. I hadn’t heard from the Center about the little guy (or girl) and feared the worse, that the little baby didn’t make it, even though when Mike and Dan left the Center, the little tyke was eating whatever it is that baby finches eat. Well, today, the Center called to say that they had released my little nestling out into the big, wide world. I can’t tell you how happy that made me feel. After having three of the finch’s nests destroyed by who knows what and another hatchling that died, I was so sad for Mama and Papa Finch, who I still see in our yard. I thought that not one of their children would make it. So this news really made my day. Again, I can’t thank Mike and Dan enough for doing what they did. They saved that little guy. This entry was posted in Birds and Butterflies. Bookmark the permalink.